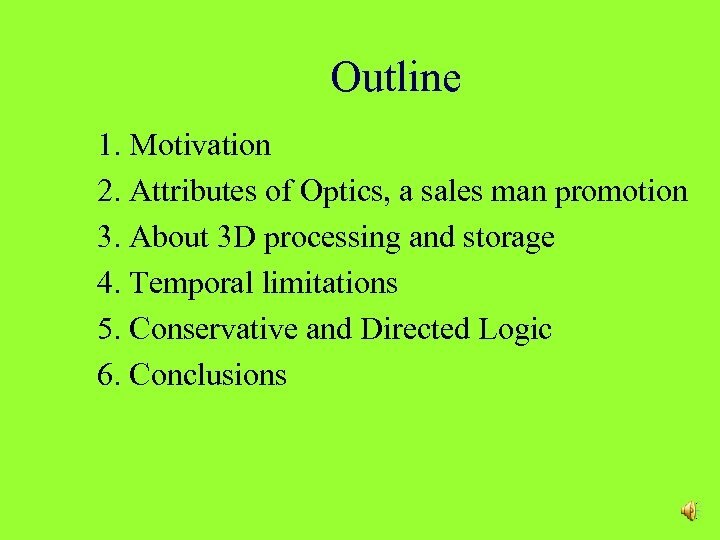 Motivation • A “salesman” promotion of optical computing: Attributes of optics: • High density of information handling, including 3 D capabilities (holography). 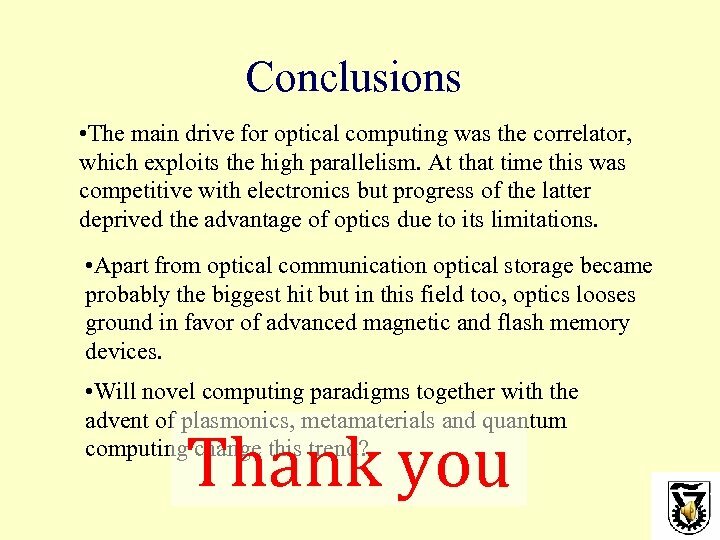 • Computing with the speed of light. • Large (temporal) bandwidth due to high frequency. 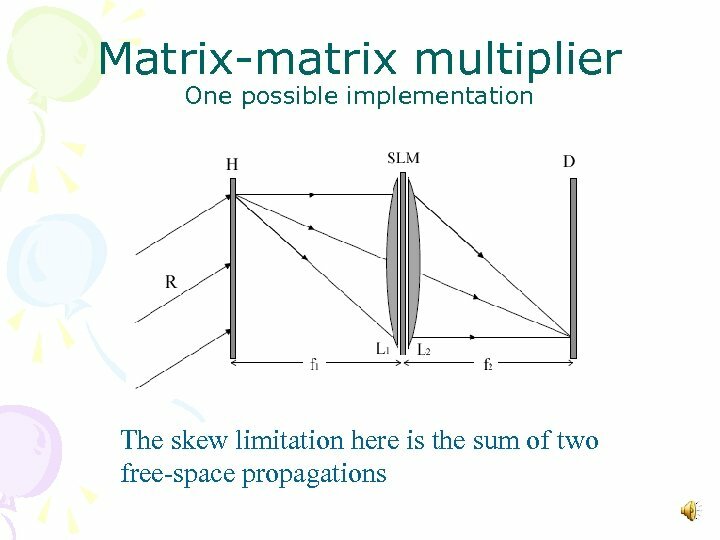 • High spatial parallelism and spatial bandwidth. Why are these statements misleading? 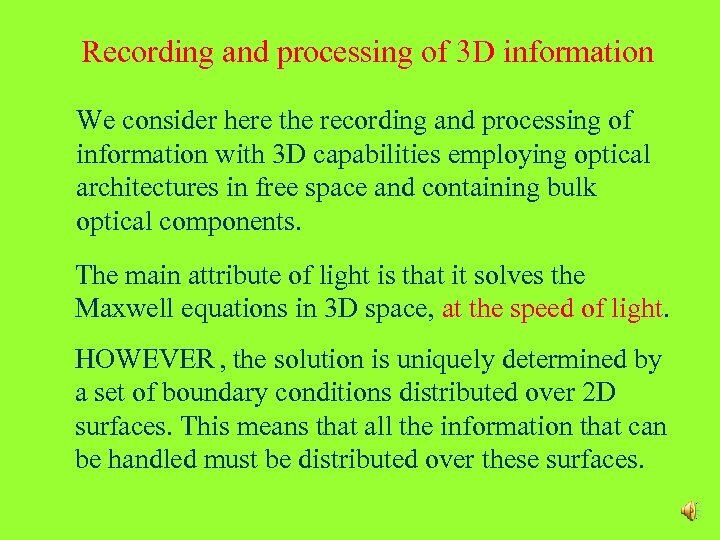 Recording and processing of 3 D information We consider here the recording and processing of information with 3 D capabilities employing optical architectures in free space and containing bulk optical components. 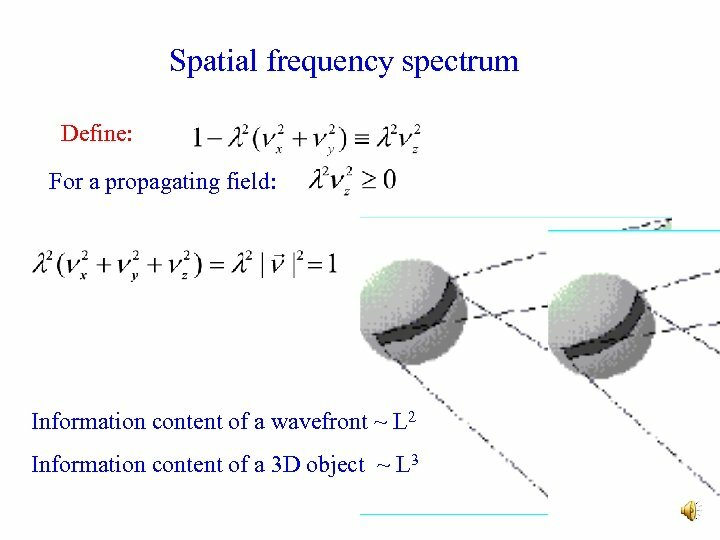 The main attribute of light is that it solves the Maxwell equations in 3 D space, at the speed of light. HOWEVER , the solution is uniquely determined by a set of boundary conditions distributed over 2 D surfaces. 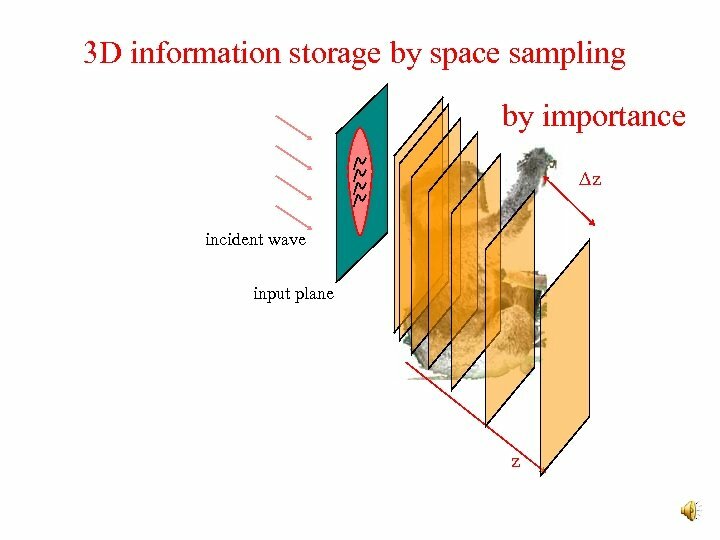 This means that all the information that can be handled must be distributed over these surfaces. Where does technology stand? 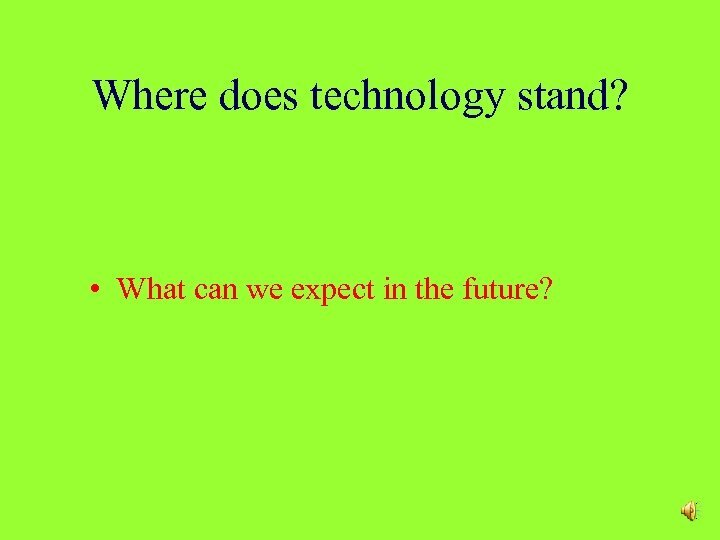 • What can we expect in the future? 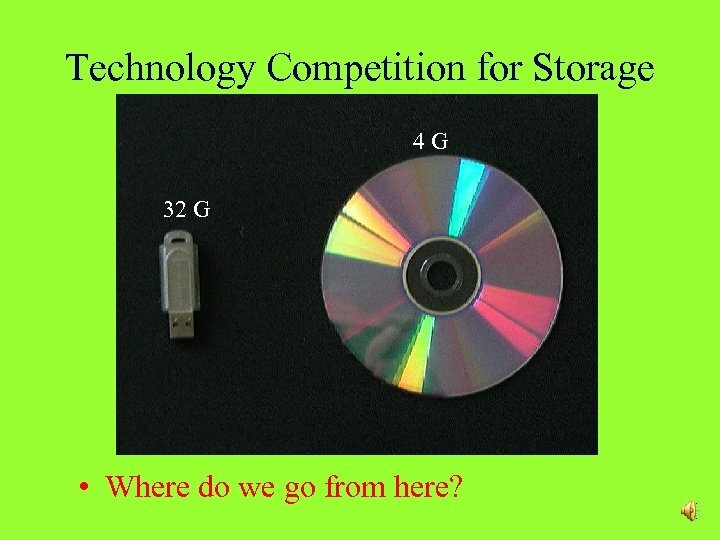 Technology Competition for Storage 4 G 32 G • Where do we go from here? 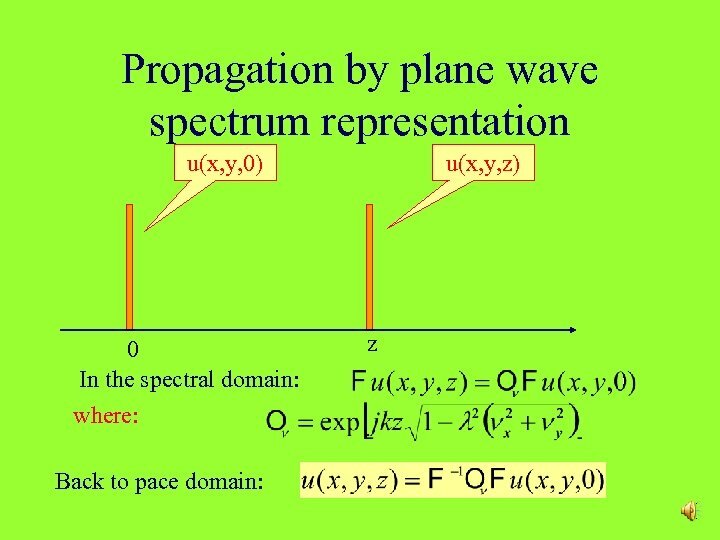 Computing with the speed of light? 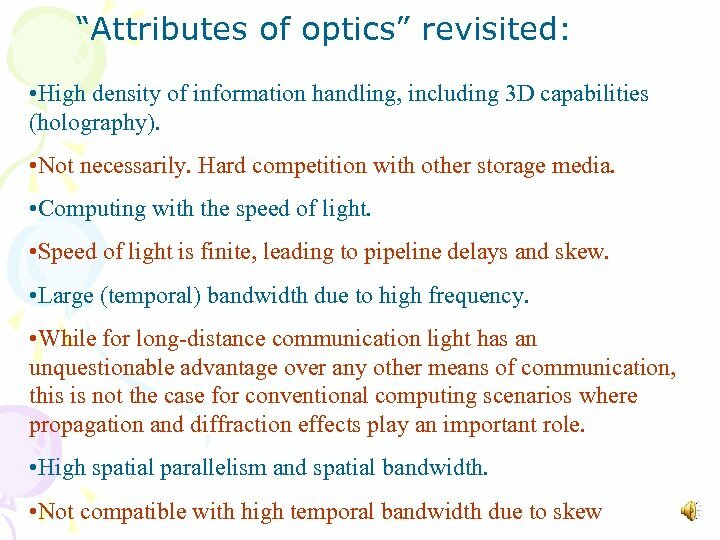 • The high velocity of light is efficiently exploited in long distance optical communication. 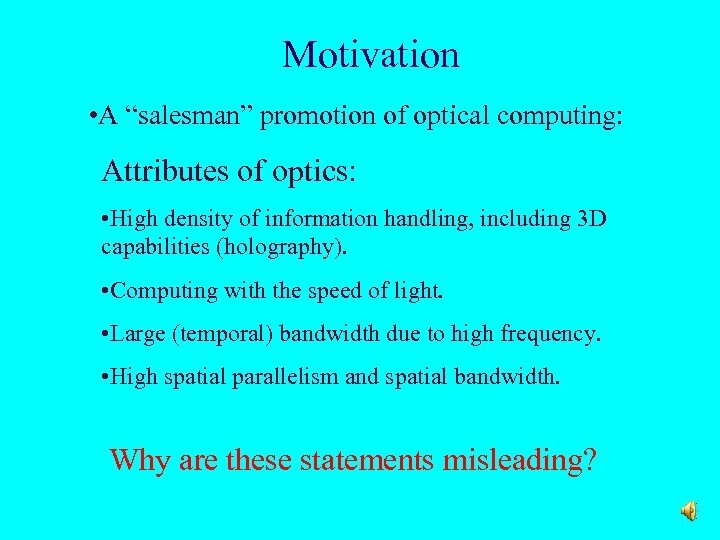 • This does not imply anything related to computing. 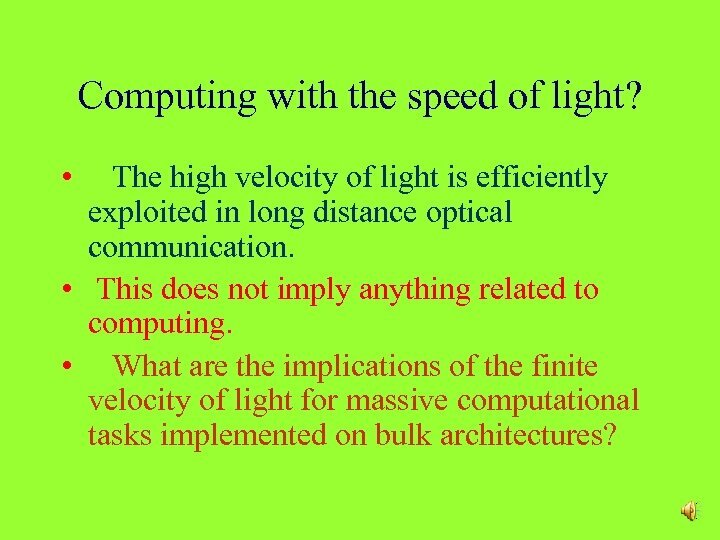 • What are the implications of the finite velocity of light for massive computational tasks implemented on bulk architectures? 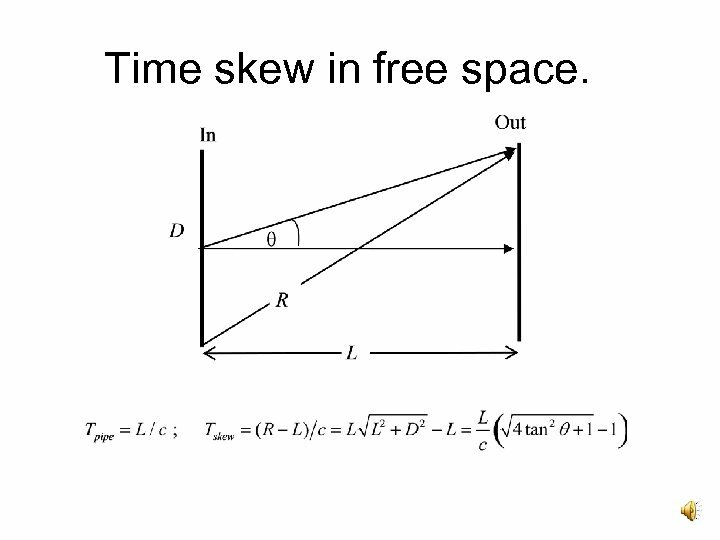 Time skew in free space. 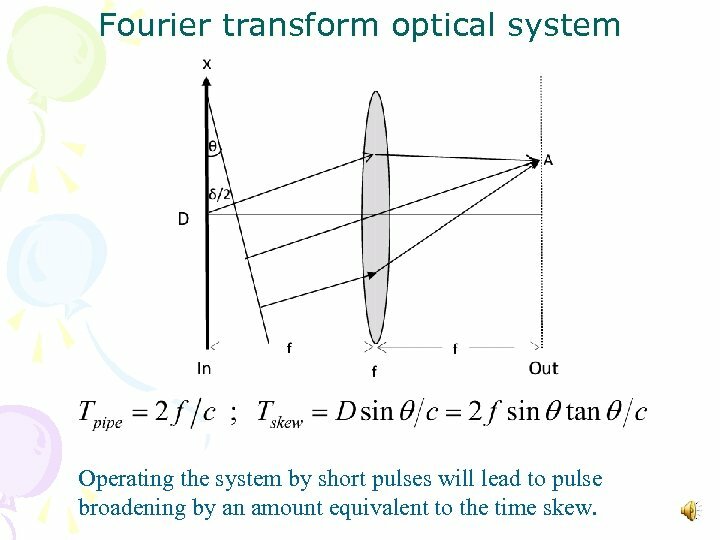 Fourier transform optical system Operating the system by short pulses will lead to pulse broadening by an amount equivalent to the time skew. 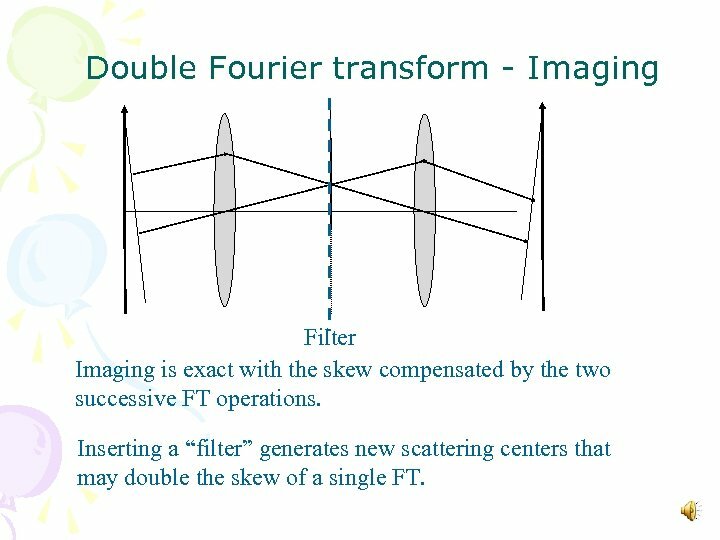 Double Fourier transform - Imaging Filter Imaging is exact with the skew compensated by the two successive FT operations. 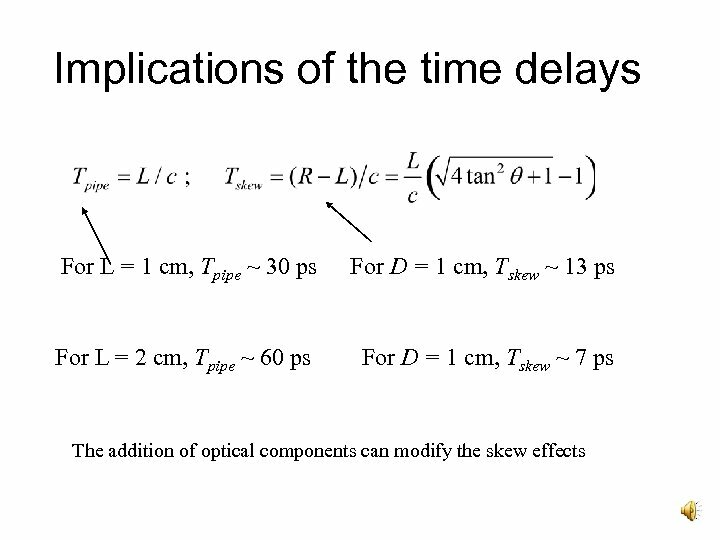 Inserting a “filter” generates new scattering centers that may double the skew of a single FT. 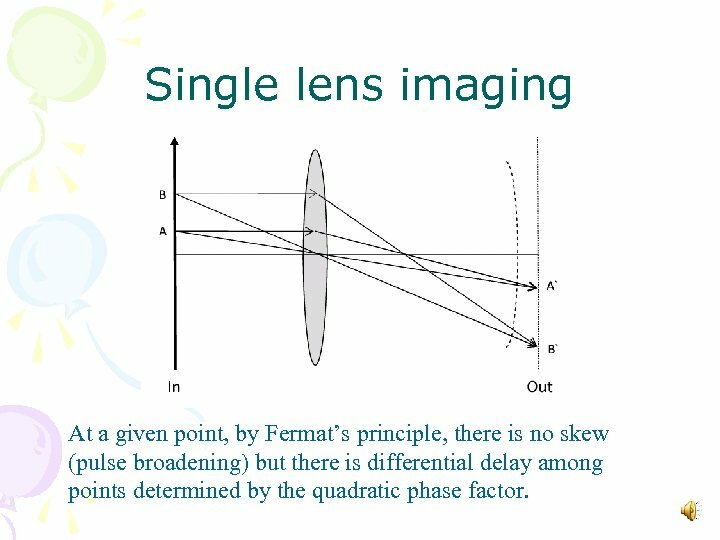 Single lens imaging At a given point, by Fermat’s principle, there is no skew (pulse broadening) but there is differential delay among points determined by the quadratic phase factor. 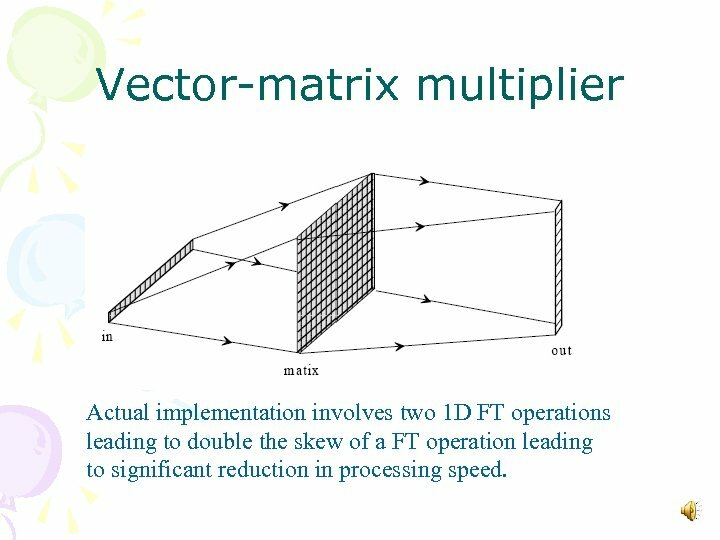 Vector-matrix multiplier Actual implementation involves two 1 D FT operations leading to double the skew of a FT operation leading to significant reduction in processing speed. Where we go from here? 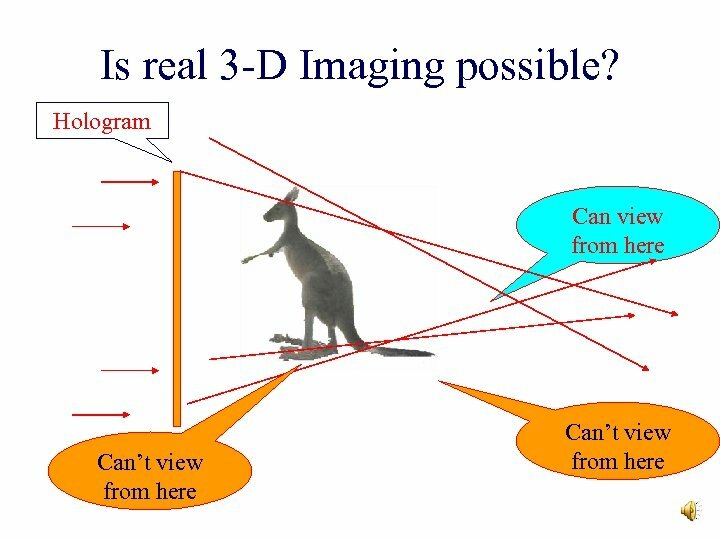 To make optics viable in computing new paradigms must be investigated. 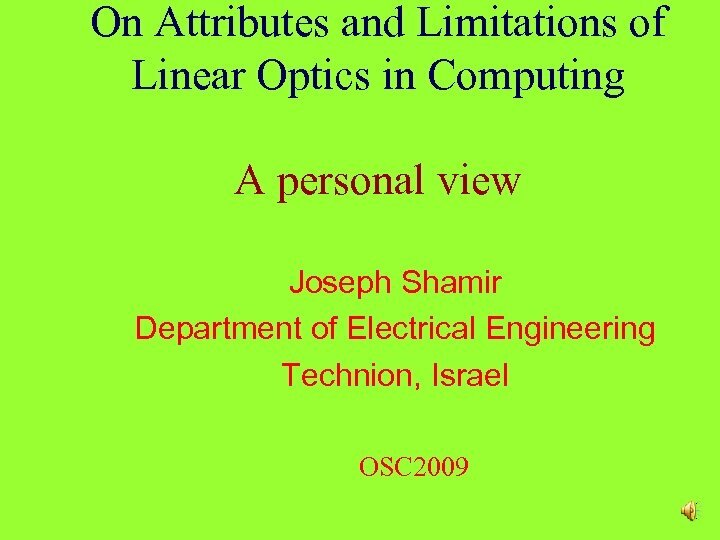 Most available computing paradigms are based on the characteristics of electrons and they cannot be effectively translated into optical procedures. 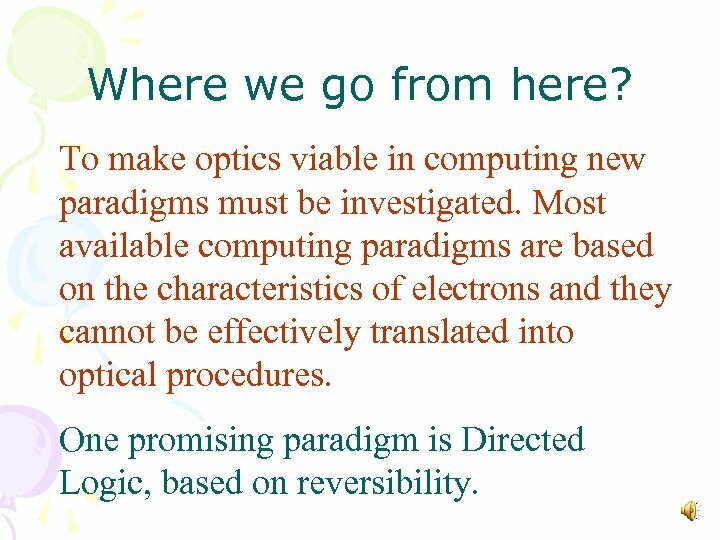 One promising paradigm is Directed Logic, based on reversibility. 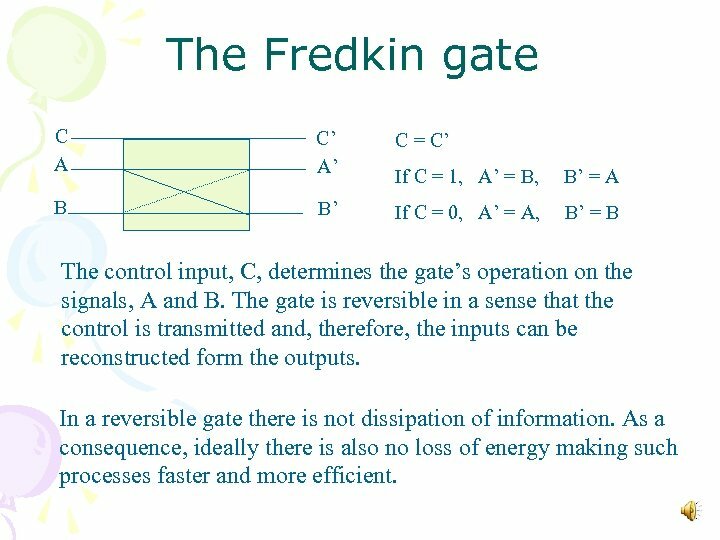 The Fredkin gate C A C’ A’ C = C’ If C = 1, A’ = B, B’ = A B B’ If C = 0, A’ = A, B’ = B The control input, C, determines the gate’s operation on the signals, A and B. 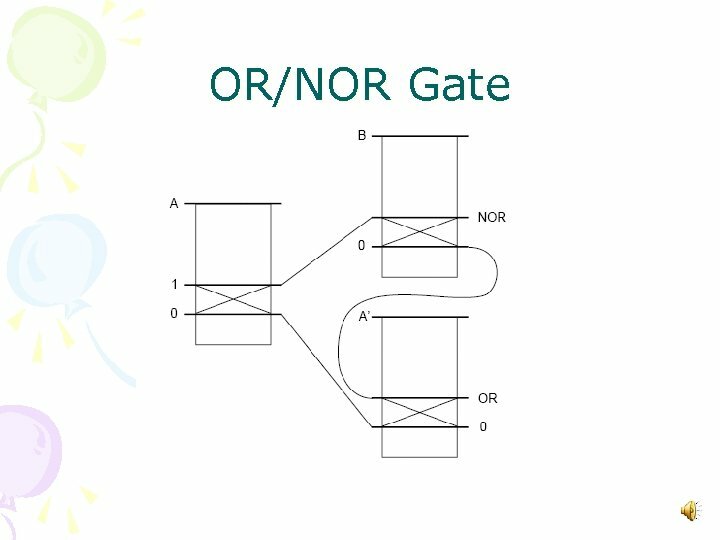 The gate is reversible in a sense that the control is transmitted and, therefore, the inputs can be reconstructed form the outputs. In a reversible gate there is not dissipation of information. 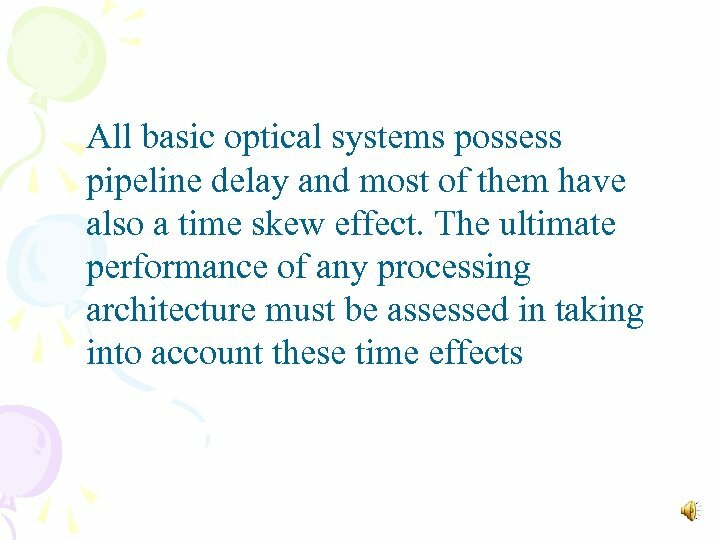 As a consequence, ideally there is also no loss of energy making such processes faster and more efficient. 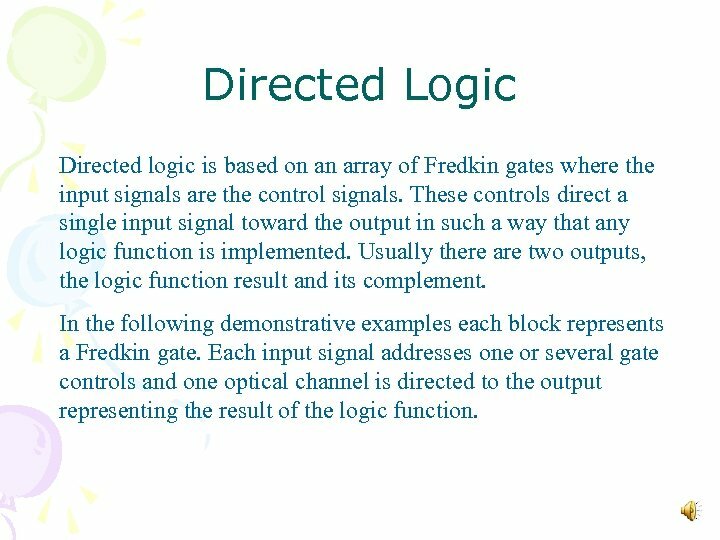 Directed Logic Directed logic is based on an array of Fredkin gates where the input signals are the control signals. These controls direct a single input signal toward the output in such a way that any logic function is implemented. 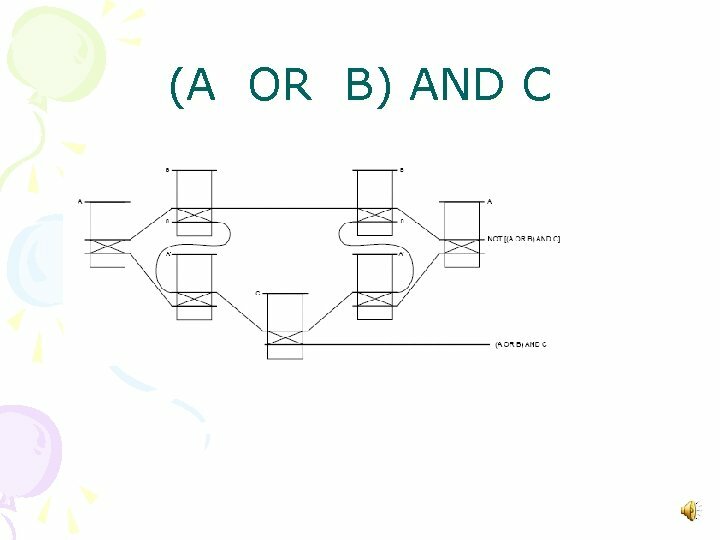 Usually there are two outputs, the logic function result and its complement. 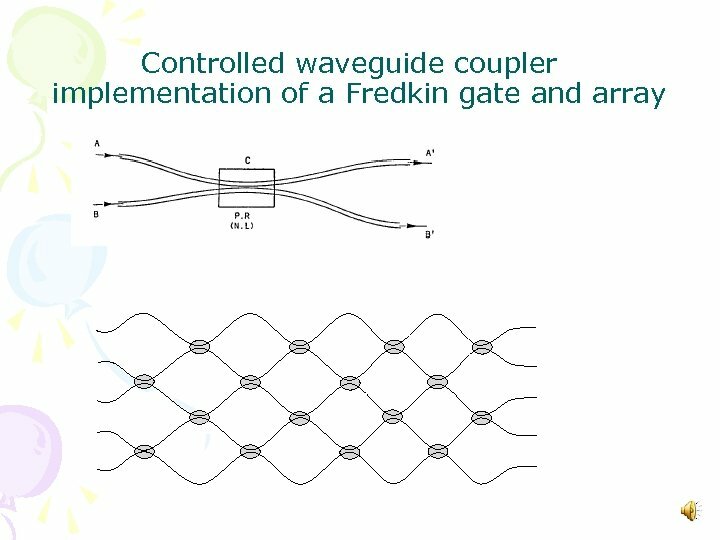 In the following demonstrative examples each block represents a Fredkin gate. 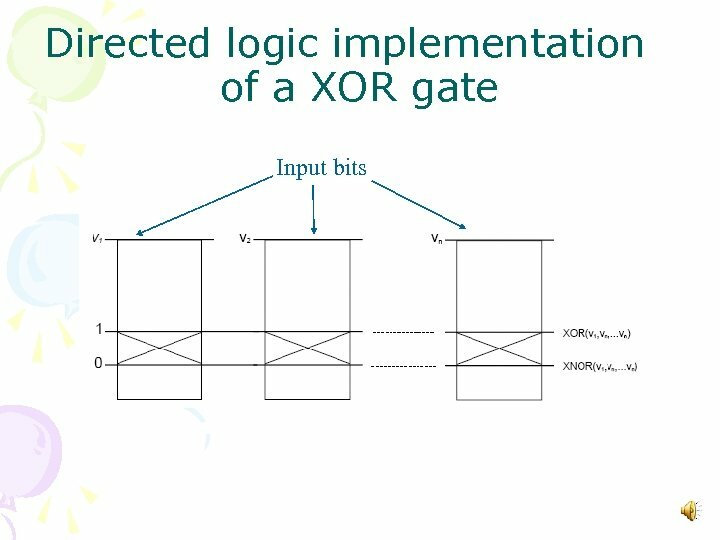 Each input signal addresses one or several gate controls and one optical channel is directed to the output representing the result of the logic function.